The below article was commissioned by The Empire Project to be included in the catalogue accompanying Erdem Küçükköroğlu’s exhibition in December 2011. Erdem Küçükkoğlu’s geometric universe, constituted by basic elements such as color, light, line, stands out with the peculiar images it articulates. 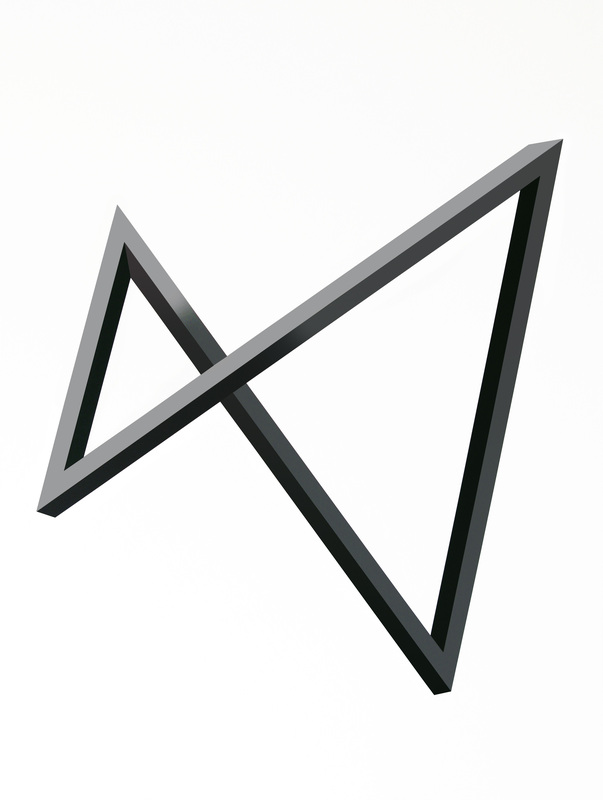 The artist’s formal world is reminiscent more of a mathematical universe than an artistic construction, interwoven with triangles, circles and other geometric shapes; the artist does not merely project geometry into art, but rather, he subjectively invades the geometric truth in an artistic and painterly manner. In order to understand this territory, it is necessary to understand art and other disciplines, such as mathematics, as equally cultural domains, as articulated by Schneider above. Only this kind of a perception can open up possibilities made available by the slippage between disciplines. It is only through this very perception that the viewers can get over the estrangement triggered by Küçükkoğlu’s works. The mental freedom behind the creative process furthers the artist’s efforts beyond a mathematician’s or geometric painter’s approach, as can be observed in the independence of the compositions and tonal expressions. After three years of color block studies, it is possible to see the linear search in Erdem Küçükkoğlu’s paintings that Mehmet Güleryüz had foreshadowed. What is striking in this period and in the artist’s overall development as a painter is his development of style, influenced by Ottoman and Far-Eastern calligraphy. In this period, Küçükkoğlu worked with black-and-white compositions for the first time and applied calligraphic lines’ two-dimensional relationship to the fore and background to geometric drawings. His drawing was carried on to a subjective realm, similar to the calligraphies that he took as examples, in which depth was defined by movement and gravity of different lanes. Furthermore, his free-hand drawings on paper in 2004 and 2005 become simpler and clearer expressions when compared to the large canvases. 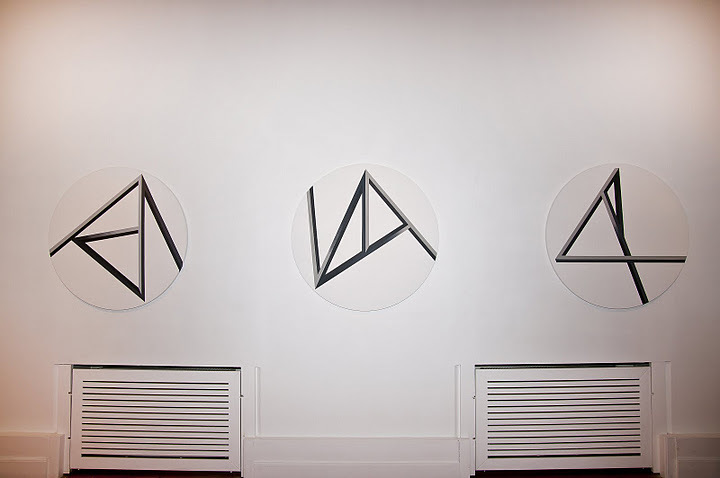 In this context, the most striking aspect of Küçükkoğlu’s works to be exhibited in The Empire Project’s exhibition space in 2012 is “the personal source of light that describes the geometric truth.” The exhibition consisting of 30 works that were applied to canvases from small Japanese album drawings, “Drawings for the geometric sculpture,” is a fiction that flies, dissipates and disintegrates. The pieces that seem to have been dispersed by an explosion are mandatorily within the boundaries of the frame. The circular canvases do not contain the images; each frame has a section that extends to the outside. These forms that come from infinity, are caught by our eyes through a hole, right where they meet. Balance, in this universe without gravity, is enabled by dimensional transitions created by the object’s positioning within the frame and light games. In Turkey, when paintings that are not realistic depictions of nature are considered to be taking “risks,” Erdem Küçükköroğlu seems to have delineated his own path by insisting on the geometric abstract, consistently. His subjective universe, which is strange to the viewer—almost erroneous—is a potentially apt, truthful reaction against our lives, dominated by perfect geometries and virtual realities. Erdem Küçükköroğlu was born in 1979, İstanbul. He has a bachelor degree of science in mathematics from İstanbul University (2004). He studied art and painting at the ‘Mehmet Güleryüz Studio’ between the years 2000 and 2004. He became the member of UPSD, National Comitee of ‘Association Internationale des Arts Plastiques’ (AIAP) in 2001. His paintings are both in private and museum collections, including Osten Drawings Museum (Skopje) and Davis Museum (Barcelona). Currently, he lives in İstanbul and works as Graphics Designer. Elif Gül Tirben is a free-lance writer based in İstanbul. Her research interests are Sociology of Art, Contemporary Art and Visual Culture. Güleryüz, Mehmet. Interview conducted by the author. Video recording. İstanbul, November, 2011. 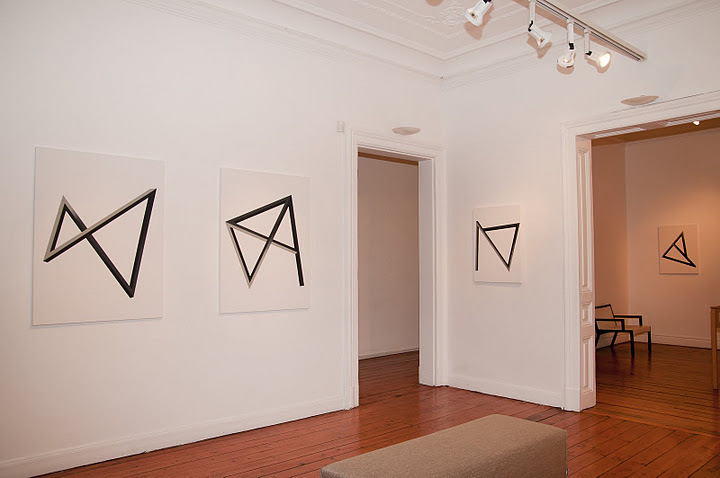 Bret Schneider, “No Way In: An Angle on Contemporary Geometric Abstraction,” September 16, 2010, http://fourninetyone.com/2010/09/16/no-way-in-an-angle-on-recent-geometric-abstraction/. Mehmet Güleryüz, interview conducted by the author, İstanbul, November, 2011. The Möbius strip has several curious properties. A line drawn starting from the seam down the middle will meet back at the seam but at the “other side”. If continued the line will meet the starting point and will be double the length of the original strip. This single continuous curve demonstrates that the Möbius strip has only one boundary. Posted in content, on artists and tagged art and geometry, Elif Gül Tirben, equilibrium, Erdem Küçükköroğlu, The Empire Project, İstanbul. Bookmark the permalink.